Tool Tech is the only true one stop shop in the region serving customers’ injection molding, mold making & design, and full service machining needs. By offering in house molding and machining services, Tool Tech eliminates hassle, costs, and excess time for its customers. With over 20 years of experience and ISO 9001 compliant, Tool Tech knows the industry and takes pride in the quality and experience it brings to the table. Tool Tech’s injection molding capabilities include insert-molding and over-molding of complex precision plastic parts. Custom injection molding in low or high volumes with a press range from 40 to 300 tons are available. In addition, mold building services include new mold manufacturing, mold maintenance, and simple to complex molds ranging from single cavity prototypes to multi-cavity production tools. Precision machining services include CNC milling, CNC turning, precision grinding, and Blanchard grinding. Metal stamping services are also available at Tool Tech. Electrical Discharge Machining (EDM) services include Wire and Sinker EDM, precision hole drilling, and electrode manufacturing. 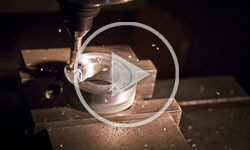 Full service tool and die capabilities include custom, prototype, and production tooling. New die design and build, die maintenance and repair, and single stage and progressive die projects are available. Learn more about Tool Tech’s one stop shop for injection molding and machining.